Big, bare, and beautiful, these architectural elements demand attention. 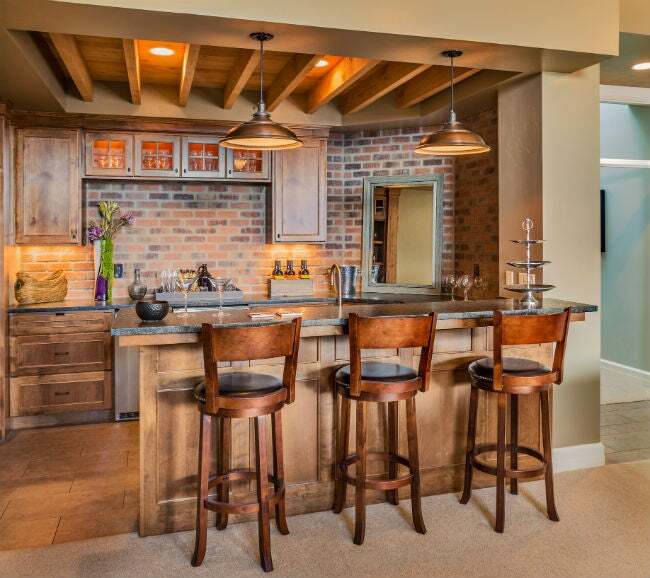 Find out if exposed beams can make a striking statement in your new home construction or renovation project. Favored for their old world and country-chic appeal, exposed ceiling beams add a dramatic sense of strength and heft to a room. If you love the look and plan to build a new home or add an extension, you can incorporate this structural component into your design. You can also bring the rustic yet elegant look to an existing home with faux beams that closely resemble the real thing. Keep reading to find out more about this timeless architectural element and how to acquire it. Overhead beams are a standard element in timber-frame construction and, while they have an undeniable aesthetic appeal, their earliest purpose was purely functional: Large beams effectively support the weight of upper floors and roofs. Logs and sticks, the precursors of early beams, were laid across the tops of stone walls. With the invention of rudimentary tools, craftsmen could carve longer beams from larger trees. Exposed beam construction became the norm, appearing in cottages and castles alike throughout Europe, the Orient, the Middle East and virtually all countries as architecture evolved. As construction technology advanced in the 1800s and lumber mills capable of the mass production of wood members appeared, massive overhead beams were gradually replaced by the smaller dimensional lumber used to frame rafters (the sloped members) and joists (the horizontal ceiling members) in home construction. From the 1950s to the 1980s, high ceilings and large beams were concealed behind lower, “dropped” ceilings during remodels to help reduce heating and cooling bills. But timber-frame assembly, also referred to as “post-and-beam construction,” never died out completely—it’s still a feature in ski resorts, mountain homes, cabins, large barns, and agricultural buildings. The installation of structural beams—those that are part of a building’s weight-bearing design—is always a job best left to the pros. Depending on the size and the material (solid hardwood or industrial steel), large beams can weigh upwards of a thousand pounds and necessitate a crane to lift and position them. In most communities, such design must be approved by an engineer before a building permit will be issued, and inspections will be required throughout the building process. Decorative beams—intended solely for aesthetic appeal—come in a variety of styles, and some can be put up by enthusiastic do-it-yourselfers with a working knowledge of basic carpentry. Yet even these faux beams can add substantial weight, so it’s wise to have an engineer assess your existing structure before installing. • DIY with dimensional lumber: One popular way of installing a faux beam is to position dimensional lumber such as a 2×4 along the ceiling, and then construct a three-sided wood box to cover the lumber, creating the beam look. Depending on the length of the ceiling beam, the weight of the wood used for the box cover, and the number of beams, you could be looking at an additional thousand pounds or more to your home’s structure. • Fake it with prefab: Fortunately, faux exposed ceiling beams made of molded fiberglass or high-density polyurethane are quite lightweight and can be installed without an engineer’s approval. 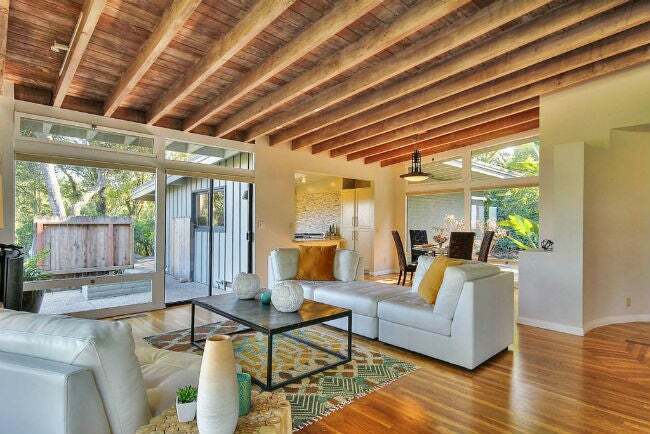 If your ceiling won’t support heavier beams, these impressive imposters may be your best bet. They come in various sizes and styles that mimic solid wood beams or steel I-beams, and can be painted or stained to match your decor. Installation is simple, typically involving mounting blocks to the ceiling and then fitting the lightweight beams over the blocks and attaching them with screws. 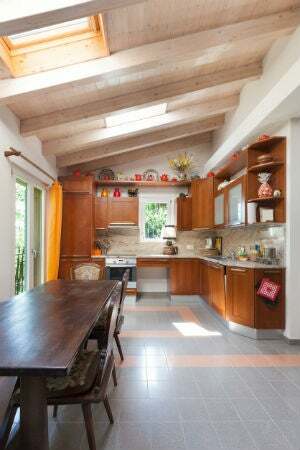 If you own a home built before the 1920s, in which the roof was originally framed with large beams and rafters, your dream of dramatic exposed ceiling beams may be waiting overhead. 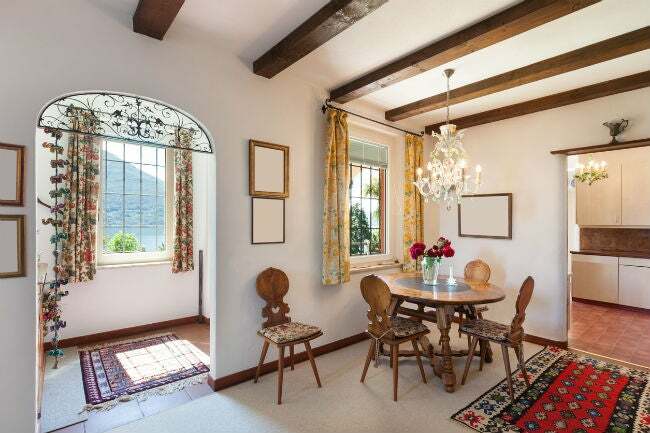 Because the beams are already a part of the structure, you can usually remove the dropped ceiling and restore the beams to their former grandeur. Bear in mind that removing the ceiling isn’t a solution in all older homes. If your existing structure features standard ceiling joists, narrower than beams and set closer together (often 24 inches apart), they won’t provide the same appearance as beefier beams spaced four to five feet, or even farther, apart. Here’s how to find out: If your dropped ceiling features acoustical tiles, push one up and peek at what lies above with a flashlight. If the newer ceiling was framed and covered with drywall, the remodelers probably left an access hatch (often found in a closet ceiling), where homeowners could access any wiring or ductwork above the ceiling. Because they’re large and often imposing, exposed ceiling beams tend to look the best in rooms with high or vaulted ceilings. 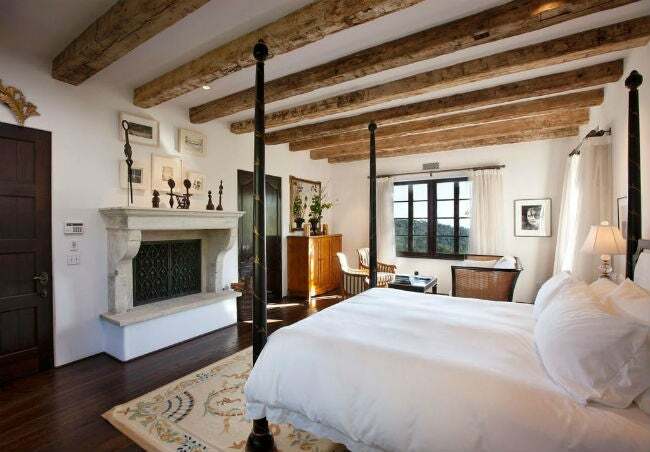 Here, odds are that exposed ceiling beams will boost your home’s appeal. But non-vaulted ceilings can benefit from the treatment, too. If you intend to install horizontal beams on a flat ceiling, make sure they won’t compromise headroom. Many local codes limit headroom to a minimum of 7’6” above the floor, so the bottom of your new faux beams should remain above that height. Beyond code-regulated considerations of structure and headroom, the sky is the limit on the way you style your ceiling’s striking feature—so let your personal design preferences and these ideas below be your guide. • Reclaimed, hand-hewn solid wood beams, which still bear visible crosscut marks from the saws used by the craftsmen who cut them by hand, add a strong Old Country look to a farm-style home with high or vaulted ceilings, a mountain cabin, or a woodland cottage. • Not all beams need be rustic. Painted beams can create a stunning look in a contemporary style home. Imagine the airy feeling created by white walls paired with painted white beams in a vaulted ceiling. Or consider how glossy black beams might look in a modern-day room featuring chrome and glass accents. • Real or faux beams can be installed horizontally or along the sloped sides of a vaulted ceiling, or both. • A single beam that spans the length of the ceiling from one end to the other at the highest point is known as a ridge beam, and it can be installed in conjunction with horizontal and sloped members to create the look of massive roof trusses. Vertical members can be included to help support the horizontal members. • Beefy arched beams set in a high vaulted ceiling will impart a cathedral feel to a large room. • Steel beams, interspersed with exposed ductwork, can create the currently trendy industrial look. • Exposed beams in a vaulted or elevated ceiling can be difficult to keep clean. Long handled dusters can assist in the removal of light dust buildup, but if the beams get grimier, such as those above a kitchen cooktop tend to do, you may need to climb a ladder or set up scaffolding once or twice a year to clean. • Expect an increase in your utility bills if you opt to remove a dropped ceiling to expose beams, because you’ll have more space to heat and cool. Installing one or two ceiling fans can help recirculate heated air that rises to the peak of the ceiling; radiant flooring can also help focus heat at the floor level. • If you’re building from scratch and want real beams, expect to pay an additional 10 to 15 percent more for your home. Real beams cost more than standard framing lumber, and because they’re heavy and unwieldy, labor costs to install them are also higher.